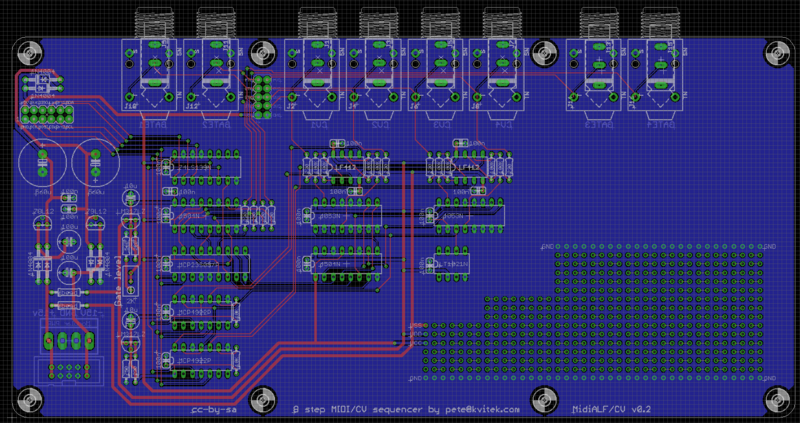 ← MidiALF/CV board routing is almost ready to go. Would you mind adding additional Pads for Gate 3 + 4 to the Back? The area at the top right is where MIDI IN/OUT connectors are on the main board, so nothing else fit in there. And if you use 3,5 mm jacks? There are pads for vertical Switchcraft 35RAPC2AV 3.5mm jack connectors (Digikey part# SC1457-ND) right on top of the 1/4″ jacks connectors. I know but isn’t there a way to make those fit all on the back? You have probably considered it all but i think the side outputs are a bit of a pitty on such a nice sequencer. Having outputs on the side takes up a lot of extra space in a desktop setup. Otherwise I’m considering designing a case wich has all the outputs on top just behind the display. The Urzwerg has this and i like that very much. I agree side connectors are ugly and I’m not going to install them in my builds. However, some people may need all 4 gate outputs. The alternative may be to move side connectors to the top and use long stand offs resulting in much “thicker” sandwich which I don’t like either. this looks to be a reasonable solution. Everything on the back, and if someone doesn’t need Gate 3/4, they can have a thinner sandwich.